Got up at 2 am this morning and started the long trek back home to Iowa with the plan of stopping in North Platte, NE for a half-marathon I was hoping to do last year and was not able to. Showed up and it was still dark, did the entire warmup in the dark and started the race with the sun still not quite yet up though definitely lightening the sky. A really neat atmosphere for the start of a small race. Got out about half a mile and realized I was on my own for this one, the rest of the pack was falling away. 6:08 to start then a 6:03, the reeled off 5 or 6 straight sub-6. Didn't get my exact splits again because of my watch, but did see most of my splits through 10 as 6:05 or better. 10 mile was roughly 1:00:0X. last 5k sucked though, we turned back into the wind and it had really picked up probably 15-20 and so that slowed me down on the way home. regardless, I felt great the whole run and just had a really strong, smooth effort that felt manageable but not overly pressed. My watch hit 13.13 miles (over a half) with about 400 meters to go on the course so I hit the stop button and clocked 1:19:18, 6:02 avg pace. This was in-line with where most of my watch splits were for the race. 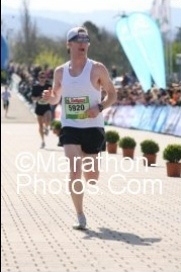 The officialy course was probably 13.3 and at least a minute long, as they had my time as 1:20:19 or something. I didn't really notice the official time because I had my half split AND I won, which was fun. Turns out I won $250 - by far the most I've made running a race. Should have probably jumped in the full - $500 to win and it wasn't too competitive either. Overall, fun to win a half - my first half win I think - and some good money to boot. got a cooldown in of 1.7. Drove home the rest of the way home, and although I was pretty sore, pretty happy from the effort. Right where I thought I'd be today. all time personal best set today - 72.1 miles in the last 6 days, a lil over 12 per day, new record by about a mile! well earned rest day tomorrow.